Sharks have livers different from other animals. It takes up much more internal space and serves more functions than simply helping with digestion; the oil inside the liver helps sharks stay buoyant under water. Also prized in the health care world, shark liver oil often is used as part of cancer treatments and to boost immune systems, according to WebMD. Shark livers take up significantly more space inside their bodies than the livers of most animals. 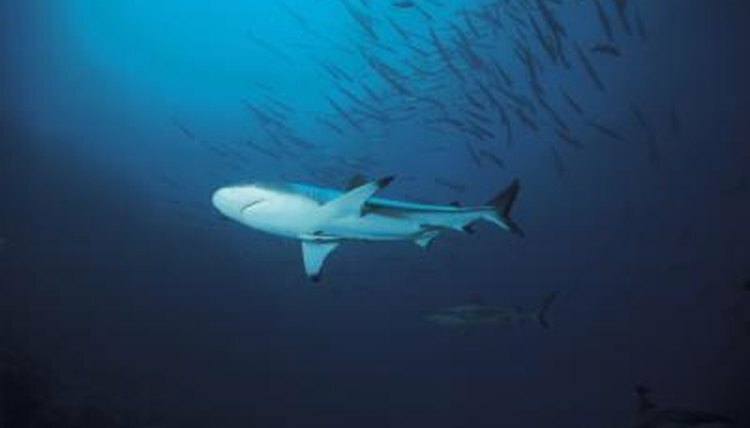 Sharks that stay close to the ocean floor tend to have smaller livers, making up about 5 percent of their body weight. Sharks that roam the open ocean have larger livers, sometimes making up 25 percent of their body weight and filling up to 90 percent of their body cavity. Like most animals, a shark's liver helps him with digestion and serves as an internal filter. It helps clean his blood, filtering waste, and it stores vitamins brought in through the shark's food. It also helps convert that food into energy and stores fatty reserves to provide the shark with energy. While digestion is an important function of a shark's liver, it's not the reason the liver is so big or why it's filled with oil. The oil, called squalene, is lighter than the water. A shark's body is naturally heavier than water, and he doesn't have a swim bladder to fill with air like some other fish. The oil lightens the shark's body, providing buoyancy so he won't sink. Sharks must keep swimming to push water past their gills to breathe, and buoyancy is key to keeping on the go and staying off the ocean floor. Sharks use their pectoral fins to help them change directions in the water, but without the oil, sharks would expend too much energy swimming and staying buoyant than they could replace with their food. Oil levels vary in sharks depending on where they prefer to swim; the bigger the livers, the more oil exists to help the sharks stay buoyant. Some shark species, such as the deep sea shark and the basking shark, provide much of the oil used for medicinal purposes because they have some of the largest oily livers. A single basking shark weighing about 2,100 pounds can provide about 550 gallons of oil.